Fans have been speculating where Breath of the Wild fits in on the Zelda timeline for as long as the game has been in the public eye. 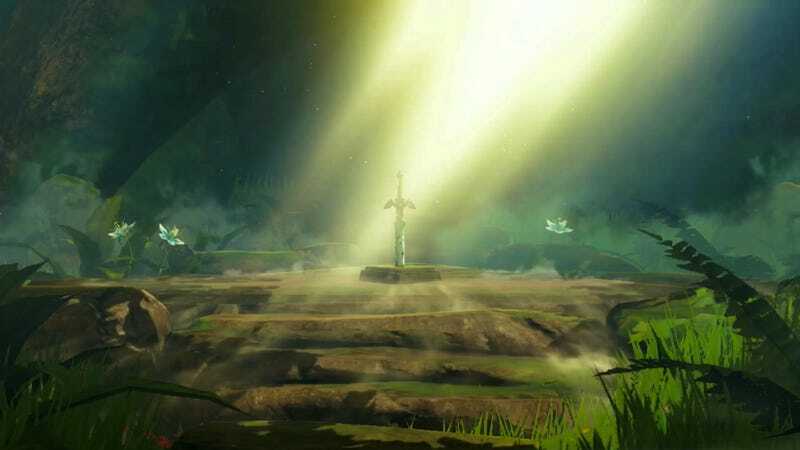 The appearance of Koroks, the Rito, and seasalt found around the demo areas suggested it was in the Adult timeline which was home to Wind Waker, Phantom Hourglass, and Spirit Tracks. Koroks aren’t a very strong argument because they’re the original form of the Kokiri and it can be reasoned that the form still makes sense because of the dense forests. Of course people theorized that it might be the Child timeline which is home to Majora’s Mask, Twilight Princess, and Four Swords Adventure(And, if it were canon, probably Hyrule Warriors) due to Aonuma’s comments that you should play Twilight Princess HD before playing Breath of the Wild, not to mention that you can bring Wolf Link into the game via the Wolf Link amiibo. Fans speculated that the latter was a hint that the game was connected to Twilight Princess in some way, but if I recall there were developer statements that Wolf Link’s appearance in the game was non-canon, which chucked a wrench into that theory as well. The key to Breath of the Wild’s placement lies within that statement. Towards the end, Aonuma says that, prior to the events of Breath of the Wild, Hyrule has suffered many battles against Ganon, implying that he has been around for a very long time. This was of course also said by an old woman in the most recent Breath of the Wild trailer where she said the history of the royal family is tied to Ganon(In this instance referred to as Calamity Ganon which is his incarnation in Breath of the Wild. ), implying that this vicious cycle has been going on for a very, very long time. We’re talking more than two or three battles. And there is only one timeline that accurately fits that description: The Downfall Timeline. As you can see here on the official Legend of Zelda timeline, the Downfall timeline has the most entries in it and all of them feature Ganon in some capacity. A Link to the Past, Oracle of Seasons/Oracle of Ages, Link’s Awakening, A Link Between Worlds, The Legend of Zelda, and Adventure of Link, all of them have Ganon in them and in all of them he is never once referred to as Ganondorf, he is simply Ganon. The information about Breath of the Wild that has been given aligns the most with the Downfall timeline and that latter part of it at that. It would likely be during the Era of Decline(Ya know, because the era before that is the Gold Era, implying peace and prosperity and the world of Breath of the Wild has been in ruins for at least 100 years. So it’s either at the beginning of the Era of Decline or after Adventure of Link. Of course, more concrete evidence will be revealed after we’ve all had a chance to play the game and take in all the information in it, which could prove that it isn’t in the Downfall timeline, but the information we have now heavily suggests that it isn’t the other two because they have the fewest Ganon encounters. The Child Era doesn’t even have a single Ganon encounter and I believe the Adult Era doesn’t either, which leaves simply the Downfall timeline.